Japanese Beetles "skeletonize" leaves by eating the tissue between the veins—defoliation that makes a leaf look like a fine, lacey doily. 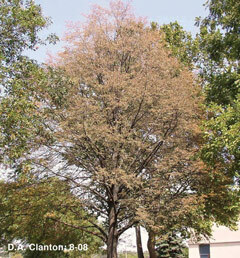 Extensive damage occurs when beetle populations reach high levels, defoliating a tree and turning it completely brown. 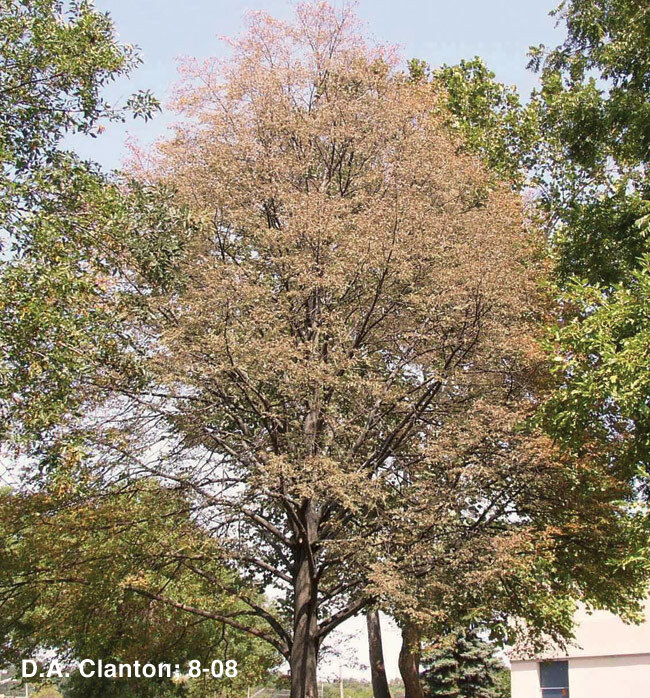 If defoliation occurs early enough in the season the leaves may reestablish, but whether they do or not this is a stressful condition that can cause serious harm to an older tree especially. At the very least damage on this scale causes severe defacement. The Japanese Beetle flies around mating and eating leaves from late June through early August. It is about one-half inch long altogether and colored a bright metallic green and orange—truly a ‘beetle-looking’ bug that is ironically a beautiful-looking work of nature. Another stowaway, the Japanese Beetle, Popillia japonica, was discovered in 1916 in New Jersey and probably introduced on Iris bulbs from Japan. It has taken all these years to make its way west to Illinois. Japanese Beetles attack a very large group of trees if hungry enough but gorge on Linden, Crabapple, Maple, Birch, Cottonwood, Cherry and Plum. They consume flowers of many types, notably Roses, and do a number on grass by eating its roots. 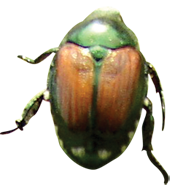 Japanese Beetles overwinter for 10 months underground as grubs and have a one-year life cycle. Japanese Beetles attack a very large variety of trees, but devour their favorites. Spraying adult Japanese Beetles with insecticide requires several applications and isn’t necessarily reliable, therefore preventive control with ground-injected imidacloprid is recommended. This insecticide translocates from the ground into the tree to the leaves, killing the beetles when they feed. A study at the University of Maryland published in 2005 of imidacloprid soil-injections of Little Leaf Linden trees cited a major reduction of feeding the first and second years after spring application. The Lindens used in this study were small, similar studies of medium or large trees cannot be found, but ground-injected imidacloprid is efficacious for the season in any tree. Fickle as to whether it will return yearly to some trees, recurrence to favorite host plants such as Linden, Crabapple, Cherry and others is likely. Soil-injection with the insecticide imidacloprid need be done by early June for same-season control, or late summer or early fall for next-season control. A defolitated Linden tree. Click the photo to enlarge. 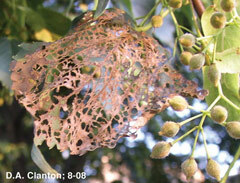 A skeletonized Linden leaf. Click the photo to enlarge.